THE ART PALACE - This building has been regarded with great critical and popular favor, because the architect, Mr. C. B. Atwood, of Chicago, has adjusted a roof and dome to the pure form of the ancient Greek temple. 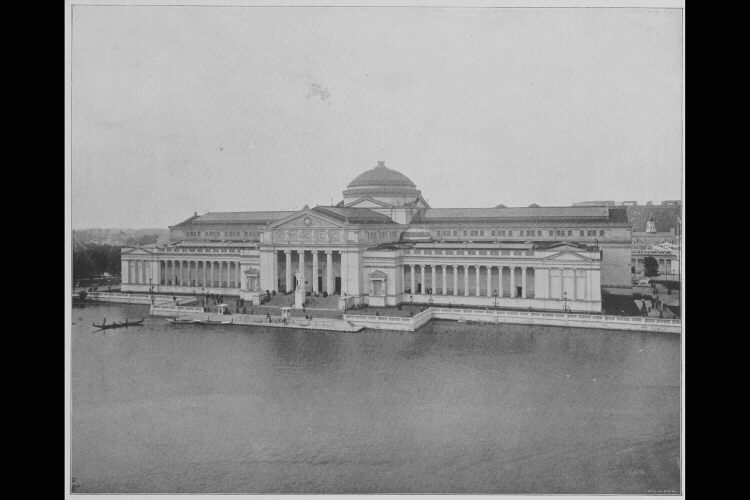 But for the presence of the Illinois Building, with its more conspicuous dome, the Art Palace would have dominated the northern vista of the Fair. This vast Ionic structure, seen here from the south, is joined with an eastern and western annex, and is built with a view to permanence, of brick and steel, at a cost of $670,000. The dimensions are three hundred and twenty by five hundred feet, with two annexes each one hundred and twenty by two hundred feet. Total floor area, over five acres; total wall area for picture -hanging, over one hundred and forty-five thousand square feet. A nave and transept intersect the building, and are one hundred feet wide and seventy feet high. Height of dome, one hundred and twenty-five feet; diameter, sixty feet. A figure of Victory surmounted the dome, but was removed. The great success of Martiny in decorating the Agricultural Buiding led to his further engagement at the Art Palace, and the stairway on the exterior is by him. The lions guarding the doorways are by Theodore Bauer and A. P. Proctor. Here were gathered the treasures of twenty nations, with statues by Aube, Bartholdi, Gelert, Donoghue, Rogers, St. Gaudens, Kretschmar and hundreds of other sculptors; and paintings by Meissonier, Lenback, Kellar, Makart, Corrodi, Tadema, Millet, Whistler, Bonnat, Dubufe, Perrault, and thousands of other artists of universal fame. There were over one hundred and forty rooms in the Art Palace, and the displays by France, Germany, Austria, England, and the United States were exceedingly fine.